These full metal construction tractors are very hard to find as they are in limited supply. We guarantee that you will not be disappointed with this Little Grey Fergie. It will last for generations and will be a delight for the child receiving this beautiful present. Made from cast aliminium to last a lifetime and become a heirloom. The tractor features solid duralast tyres and has a very good rubber grip to ensure that this tractor will never get stuck in the mud!!! good turning circle, easy to pedal and a sturdy seat. 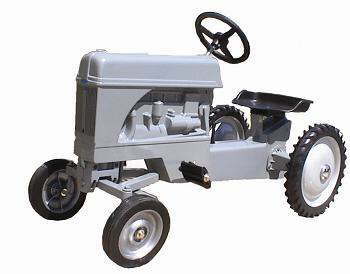 Features: Large treaded rear tyres, heavy duty ball bearing chain drive, turnable steering wheel, realistic engine, comfortable seat. The tractor is made to an exceedingly high standard and will keep your little ones busy of hours. Dimensions: 37" x 19" x 25"